for making a lining, but nothing about how it gets connected to the bag. So I'm wondering how others on the list make lined bags. Do you attach the lining, or just insert it so it is washable? If you attach it, can you describe how you do it, or point me to a website with instructions you use? I line every bag/purse I make because most yarn stretches and the lining helps with that. Plus lining keeps things like bobby pins, pens/pencils, combs, etc. from sticking through the crochet. I use a washable fabric, unless I have no intentions of ever washing the purse. I wash the fabric before I make the lining because many fabrics shrink after washing & drying. I make the lining after the purse is finished. If the purse is flat measure from side to side and add one inch for the seam allowance. If the purse has sides measure one side, plus the side measurement, plus the extra inch for the seam. This is the width of the piece of fabric you need. Next measure the purse from top edge of the front, around the bottom and up to the top edge of the back - don't include the flap - add one inch to this measurement. This is the length of the piece of fabric. Cut a rectangle according to your measurements. Fold the fabric in half, lengthwise, wrong side of the fabric facing out. Sew a 1/2 inch seam on each side. Make a 1/2 inch hem along the top edge of the fabric. Slip the lining inside the purse and, using thread that will match the purse, sew the top edge of the lining to the top edge of the purse. I do machine stitch the side seams and top hem of the lining but I usually hand stitch the lining to the purse. When you sew the lining to the crochet, can you give a little bit more detail on that part? For instance, do you sew a certain distance from the edge, do you sew into the crochet stitches or through them, etc. I put the lining just under the edge, maybe an eighth to a quarter of an inch. A lot depends on the stitch pattern and what's easy to line up. I just don't want the lining to be visible from the outside. You also want the lining to sit on the bottom of the purse or it may "pull" when you put things in the purse. It's okay for the lining to be a shade larger than the inside of the purse. You're basically just keeping the lining in place so I sew into the crochet stitches but try not to have the sewing show on the outside. Although, once I was in a hurry and was doing a small purse for everyday use and I actually sewed the lining to the purse with my machine. I kept a nice straight line on the outside and it looked just fine. So, you see, a lot depends on how you want the purse to look. A tiny bit of additional information about lining a crochet bag. When you do a lining insert, try to keep the volume of that insert a little smaller than a bag. 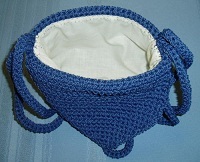 This way a crocheted part of your bag won't take too much load, but insert will. 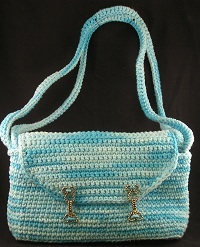 Hence, it will keep a crochet bag undeformed and looking nice for a longer period of time. Have you tried http://www.thepurseworkshop.com ? There's a cool tutorial at http://www.thepurseworkshop.com/Granny-Square-Pucker-Purse.html that goes right through making the bag and the lining and stitching it together. This also has the added info on adding plastic canvas to make it stiffer - which is something I've thought about because I'm planning on making some of my own bags to use when shopping to cut down on the paper & plastic trash. I like to sew (needle and thread or sewing machine) the fuzzy part of Velcro to the inside of the lip of the bag. I sew the spiky part of the Velcro to the outside of my lining. If it's a big bag, sometimes I add a tab of Velcro in the bottom, just to keep the bottom straight. 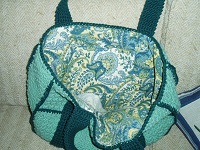 I started out using Velcro because I made a lacey purse and liked to change the lining for different seasons. Now, I do it because it's easy to take out the liner for a quick wash. I was wondering how anyone and everyone here attaches a lining to a purse. Do you hand sew the lining or do you machine sew the lining? I've done both. I prefer the machine because it seems to hold better in the long run and I'm not really fond on hand sewing. I use stips of embroidery machine stabalizer to cover the crocheted area so the feed dogs on the machine don't mess it up. Carefully pin the lining to the crochet, put the stabilizer strips (I buy the stuff in yards and cut the strips myself. I've also used newspaper, but the stabalizer stuff works better) on back and front and pin them in and carefully stitch it all together. I've used this method for crocheted baby buntings, crocheted bags - almost anything crocheted that I need to put a zipper in.